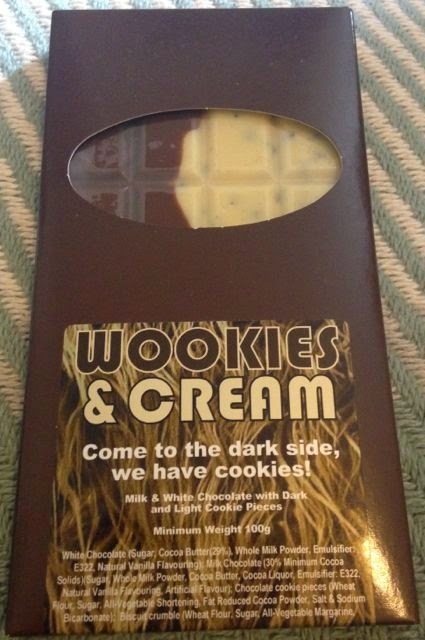 This Wookies & Cream chocolate bar was made to commemorate the new Star Wars film soon to be on our big screens. Any Walking Carpet will tell you that I'm quite the Star Wars fan. I love all the movies, yes, even the newish three set before the three originals that some people have not enjoyed. I've also immensely enjoyed all the Clone Wars cartoons and grew up on Star Wars toys when I was a lad. It states on the front of the packet that you should "Come to the dark side, we have cookies!" This makes me wonder what a Sith Wookie would be like as an evil character. I'm sure he'd be very dark and hairy, and have a red lightsaber with a fine curved wooden handle and be armed with a Wookie Bowcaster to blast the more troublesome Jedi with. Liquidising that character in my mind, adding in a decent dollop of cream and making him into a chocolate bar didn't quite appeal, but how else would you make Wookies & Cream? Trying to shake that image from my head I decided to try and find out! 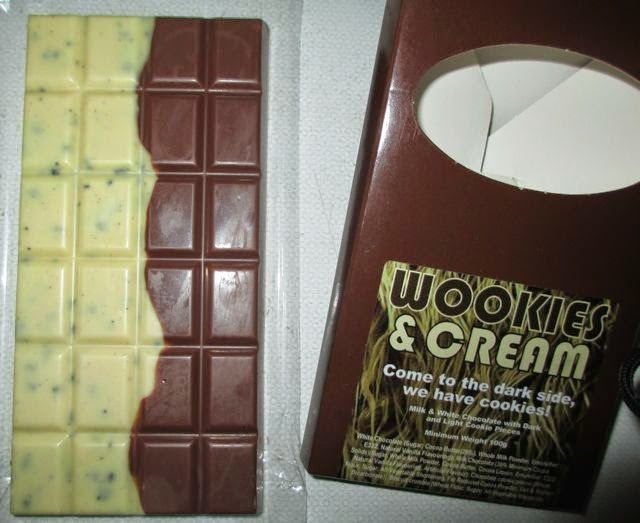 It stated on the packet that this Wookies & Cream bar included milk and white chocolate and had dark and light cookie pieces (cookies not Wookies) in it. On opening the packet I quickly got the feel of what a liquidised evil Wookie would look like if you added cream and made him into a chocolate bar. So I took a photograph! The dark cookie pieces had been added to the white chocolate and tasted like a creamy mixture of white chocolate and crunchy dark cookie, whilst the light cookie pieces and been added to the milk chocolate in a half and half fashion. it was clear that a lot of thought and care had gone into the creation of this chocolate bar. Ignoring the theme for a second the creator had really gone to town here. I'm not a chocolatier by trade, but understand the moulding stages and creating of the chocolate and cookie pieces. The presentation was neat without overly trying to be neat, ordered without overly trying to be ordered. The quality of chocolate was excellent and the cookie pieces added a crunchy body that I'm not used to in bars such as this. Even if you don't like Star Wars or couldn't care a fig for it, at least give one of these bars a try. If you like white chocolate and/ or milk chocolate and cookie pieces, you'll love this bar. If you do like Star Wars this may be as close to what an evil chocolate Wookie would taste like with cream. Packed by Cybercandy ingredients in the 100g bar can be seen in the photograph.